On 1st and 2nd June 2013 several Chairman and Safety Officers from European Federations participated in the EHPU ESTC held in Oslo/Norway. Please see here for a summary. Europe Air Sports 25th General Meeting was held in Copenhagen on March 23th and 24th 2013. Among the 50 participates was 3 former EAS Presidents and a former general secretary to talk about the history and development of EAS from 1988 to 2013. It was a good meeting and EAS is taking good care of hang gliding and paragliding interest in regard to EU legislation and EASA. As soon as official minutes are sent out, it will be sent out to EHPU members. But here is a shot summery of items regarding hang gliding and paragliding. New proposal in EASA for mandatory reporting for occurrences are at the moment including hang gliders and paragliders together with other annex II plains except model plains. Occurrences are not serious incidents, which will be listed later in the EASA document and must be reported to NAAs and EASA. Peter Bombay was guest speaker at the meeting and is the deputy head of Aviation Directorate in the European Commission in EU. He was not against removing some of the annex II plains from mandatory reporting of occurrences. The proposal is still being discussed and EAS is working for that HG/PG together with other specific annex II plains will be removed from the final proposal. Remotely Piloted Air System (RPAS) are also being followed by EAS and may affect our pilots. At the moment work is only moving alone slowly and it will take several years before EASA regulations are ready. It is the EAS opinion that RPAS must fly safely without limitations for other airspace users or demand for our pilots to carry more instruments. NAA and NAC are changing in several countries to allowing NAC or federation to do more of the governing for the NAA. This may be seen as some of the positive effects of SERA and the international financial crisis... EAS of cause supports this development and are happy for the NACs and federations, whom has good cooperation with their NAA and are allowed to assume more responsibility for the daily operation of GA flying on a national level. EAS’s economics is good, but 2 NACs has terminated their membership do to financial problems and one NAC has asked for reduced fee. EAS has a good liquidity and has annual expenditure of about € 170.000. With the current level of activities and expected income, the budget showed a acceptable positive surplus to be brought forward. The EAS annual fee was therefore set to the same level as it has been for the last several years. EHPU’s annually fee to EAS is € 9.230 for the amount of 30.-100.000 members. Please note that some countries may demand additional qualifications. Please visit the national hang gliding and paragliding federation for further information on national rules. Just click on the national flag of member links here. Europe Air Sports is pleased to report good progress on the General Aviation Safety Strategy. Readers will remember that this strategy, endorsed by EASA's Management Board, seeks to review the regulatory regime for the light end of aviation in order to make it more appropriate for recreational flying activities. In the past weeks EAS representatives have been in close dialogue with the European Institutions in order to help implementing the strategy. As part of this process EAS has just uploaded various new documents its website. These include a Roadmap by the Commission, a living document informing about the next steps, and EAS' submission in response to the strategy. Dara Hogan from the IHPA in Ireland welcomed the 29 participants of the European Hang Gliding and Paragliding Union Annual General Meeting 2012 in Dublin on 11th of February 2012. Beside the 17 member nations the meeting was attended by special guests from European Air Sports and Asociación de Vuelo Libre Española AVLE. 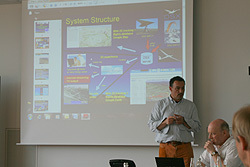 The president of EAS - David G. Roberts – held a presentation on EAS work with EASA. EAS help to ensure that we remain safe in Annex ii and are regulated national. EAS had successfully fought EASA proposals on aerodromes and had some success with medicals being set at an appropriate minimum level. Airspace is basically still a national issue and SESAR is mainly about the upper airspace. The European Commission has directed EASA to focus on six issues for the next four to five years. Reviewing Annex ii is not on that list. So we should be safe for a while. But we were warned to beware of accident rates and deaths. EASA is a ‘Safety’ organisation - European Aviation Safety Agency. They could reassess Annex ii and regulate us if we come to their attention. Chris Borra presented a shortened Airspace report. He wants to establish better communication between the EHPU Airspace Officer and the Europe Air Sports Airspace effort. He reminded the meeting that Annex ii does not protect us from SERA. He believes that it is possible that SERA does not apply to A/c that are not required to be registered. Angus Pinkerton’s Airworthiness report was accepted. It was agreed that the EHPU would fund up to € 7.000 per year for two years for the AFNOR secretariat to allow work to continue on the EN standards revision. It was suggested that Angus should seek funding from the PMA and the Test Houses to ideally arrive at a three way equal split. 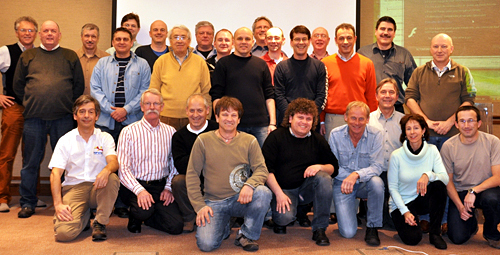 John Lovell presented the Safety and Training committees report and meeting the 5th/ 6th November 2011 in Budapest. The report was accepted. John’s desire to step down from his role was noted and the meeting asked to consider nominating a suitable successor. Andreas Mezger from AVLE explained that the AVLE was formed one year ago to create a unified Spanish association, independent from the NAC. At the moment Spain has seventeen regional federations who deal with all air sports disciplines. The AVLE has 500 members already. They believe that there are 4.000 Spanish HG/PG pilots in total. After discussion among the EHPU members it was decided to offer membership to the AVLE on the basis that, in line with our statutes, they currently appear to be the major representative body in Spain and that no other body has ever come forward from Spain. Inigo Radin and Andreas needed to consult their committee about accepting EHPU membership. The situation of competitions and safety in CIVL was discussed at length. The key point was that the EHPU believed that CIVL should continue with certified gliders only. Discontent felt by the majority about holding international competitions within Europe using uncertified gliders. In addition, increasing concern was expressed about the risk of legal liability for competition organisers from National Bodies. A joint letter to CIVL was drafted and approved. This letter was emailed to CIVL on Tuesday 14/02/2012. The EHPU Treasurer - Hans Peter Fallesen – went though the economy of EHPU. The 2011 account was approved and budget for 2012 was accepted. There were discussions on EHPU Awards, an Italian petition, Helmet straps and EHPU Bank Account. Mark Dale announced after five years as Secretary General of the EHPU his intention to step down. Chris Borra and Rasmus Rohlff both indicated a possible interest in taking on the role. Any others interested should email the General Secretary as soon as possible. After the meeting and voting on mail Rasmus Rohlff was elected as new Secretary General. Mark Dale was thanked for his great job for international Hang Gliding and Paragliding in EHPU. Next president of EHPU is Luca Basso from Italy until next meeting the 16th and 17th of February 2013, which probably will be held in Sicily. Dara Hogan from Ireland was thanked for his Presidency and hosting the meeting in Dublin 2012. The European family in EHPU has just become one country richer as Spain is entering as 18th member. Asociación de Vuelo Libre Española AVLE was formed one year ago to create a unified Spanish association, independent from the NAC. At the moment Spain has seventeen regional federations who deal with all air sports disciplines. The AVLE has about 500 members already and they believe that there are about 4.000 Spanish HG/PG pilots in total. At the Annual General Meeting of EHPU on 11th of February 2012 in Dublin, the AVLE was offered membership on the basis that they currently appear to be the major representative body in Spain and that no other body has ever come forward from Spain to be a member of the EHPU. The EHPU members hope that the membership will support AVLE to unify the Spanish pilots and get positive benefits of cooperation with the other 17 European members, who represent over 100.000 pilots together. 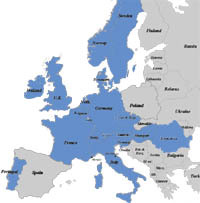 The 18 EHPU members are now: Austria, Belgium, Czech Republic, Denmark, France, Germany, Hungary, Ireland, Italy, Netherlands, Norway, Spain, Portugal, Romania, Slovenia, Sweden, Switzerland and United Kingdom. Photo by Rasmus Rohlff On the 19th Feb 2010 the EHPU convened for its tenth Annual General Conference. The EHPU was founded in order to ensure that the needs of Hang Gliding and Paragliding are heard by the European government bodies like the European Parliament, the European Commission, EASA and Eurocontrol, with the aim of protecting and promoting our sport. The EHPU is a member of Europe Airsports, the umbrella organisation for all airsports in Europe. Europe Airsports coordinates the efforts of the different airsports representing 650,000 active pilots in numerous European bodies. Gunter Bertram, Vice President of Europe Airsports (EAS) attended the conference and made a short presentation on European Airspace matters and SERA. Access to airspace is a major concern for the EHPU – especially the impending Standardised European Rules of the Air (SERA) regulations. EHPU Airspace Officer Chris Borra reported that two of the key remaining issues with SERA were flight below 150m and the lack of a separate definition separating hang gliders/paragliders from sailplanes. He also commented on his difficulty in getting clear information on the situation regarding SERA. The EHPU environmental officer Thomas Senac and his small Working Group had produced an EHPU position paper on Ecological Matters. This was approved by the AGC. Angus Pinkerton reported that CEN TC136 WG6 had been reactivated to review EN926-2, the Paraglider Flight Test Standard. The first meeting was held during December 2010, and there is every indication that all the participants are determined to work well together to produce an improved standard. Both EN926-1 (the paraglider load test standard) and EN12491 (emergency parachutes) have reached their automatic review dates, and TC136 have been informed that both standards will require to be reviewed, and almost certainly amended. WG6 will take on these items after completion of the EN926-2 update. The EHPU had previously agreed to make a formal proposal to CIVL and the BHPA had therefore done this. It was agreed that nothing had changed in the EHPU position regarding the desirability of pilots flying certified gliders, especially in Category 1 competitions. In a ‘round the room’ survey it was established that in twelve EHPU countries the CIVL delegate will vote in favour of this proposal. In the remaining five countries the situation was less clear. It was calculated that with CIVL having 60 voting members, it is uncertain that our votes will win the day. But nevertheless they send a clear message about the direction the EHPU countries wish CIVL to take as part of their efforts to improve safety at competitions. Marion Varner explained further the situation regarding commercial Instructors taking students to France. The School/Instructor must send their qualification procedures to Marion, in English and the FFVL will inform the French authorities whether these meet the required standards. A French language version of their insurance policy document is also required. The police will arrest Instructors working without the correct paperwork. Permission will take a ‘reasonable administrative time’ – so six weeks or so. The rules regarding paramotors are under review in Denmark. In a ‘round the room‘ survey it was seen that in some countries paramotor pilots fly within the hang glider/paraglider association, in some they fly within the microlight association, in some they have their own association, and in Switzerland they are banned. Charlie Jost then updated the meeting on developments in electric powered hang gliders and paragliders – and the fact that in German it seems likely that with short duration battery packs that only provide a launch, hang gliders and paragliders fitted with electric powerpacks will remain classified as unpowered. At the end of the AGC the EHPU presidency rotated to Ireland. Next EHPU AGC will take place 11th February 2012 in Dublin. The President of The Italian Republic has subscribed the new law concerning the sport flight in Italy . 1) From next November 21 in Italy only free flight (not motorized microlight or ultralight) can fly VFR with vertical limit FL 195 in free “G” spaces (outside clouds ATZ CTR & C.) about 5900 meters if space is free. 2) Free flight can fly over cities, roads, railways & C. (before it was formally prohibited) at the flight level that allows to gain a safe landing. 4) Any free flight license of any European country is automatically recognized in Italy. 5) In Italy the medical requirements are more strict than before. It was a hard work for FIVL and being inside EHPU was important to convince Italian authorities. This is a good news for EHPU too! Of course a good news for any European pilot. Roughly 10 years ago the EHPU was founded, in order to ensure that the needs of Hang Gliding and Paragliding are heard by the European government bodies like the European Parliament, the European Commission, EASA and Eurocontrol, with the aim of protecting and promoting our sport. The EHPU is a member of Europe Airsports, the umbrella organisation for all airsports in Europe. Europe Airsports coordinates the efforts of the different airsports representing 650,000 active pilots in numerous European bodies. The Europe Airsport’s vice-president Rudi Schuegraf reported to the EHPU Annual General Conference (AGC) that there is a worry about the increasing interest in UAVs and the potential dangers of them operating in the same airspace as manned aircraft. EHPU General Secretary Mark Dale added that we must pay attention to the creation of Standardised European Rules of the Air (SERA). Other than these issues, Hang Gliding and Paragliding should remain ‘protected’ within Annex II from European legislation for at least the next 5 years according to Rudi Schuegraf’s report. The national Authorities will stay largely responsible for HG and PG regulations in their countries. An EHPU position paper on National Regulation has been approved by the AGC. It can be used by the EHPU members for their negotiations with national bodies. For the EHPU the biggest concern is airspace. EHPU Airspace Officer Chris Borra reported to the AGC that the Eurocontrol project "Single Sky" is not going to harmonise the lower airspace. The national Authorities will remain responsible for lower airspace regulations. An EHPU position paper on Airspace has been updated by the AGC. Environmental problems are a concern in many countries where environmental groups and hunting organisations demand restrictions for our sport. The EHPU environmental officer Thomas Senac is collecting all scientific studies about the effects our sport has in reality, in order to make them available and for drafting an EHPU position paper on this. Best practice examples of EHPU members on dealing with this thread have been discussed by the AGC. DHV safety officer Karl Slezak informed the AGC about the new Airworthiness regulations of the German Aviation Authorities LTF. Most of the LTF requirements are identical with the 6 year old EN standard. Some important safety points are new and are proposed to EN for implementation. EHPU chairman of the subcommittee airworthiness, Angus Pinkerton, spoke about the revision of EN926-2 (paraglider flight tests), which hopefully will cover the LTF proposals, and about the EN Parachute standard which appears to require some revision following the Swiss comparison tests. It was suggested and agreed that pilots participating in organised competitions should only use certified gliders. It was also felt that the time had come to make dramatic changes to the sort of tasks being set. It seems particularly dangerous that tasks are always based on how fast a pilot can fly his glider. Also it was noted that the pilots themselves had too much influence in the whole structure of Competition Flying. We know of no other sport where the competitors themselves are almost entirely responsible for dictating the format of the competition. While we understand the need for competitors to have a voice, the detail of the general format should not solely lie with them. The AGC decided to send a new letter to CIVL and to more closely control the votes of the EHPU member delegates for FAI/CIVL in the future, in order to promote the EHPU policy effectively within FAI/CIVL. Marion Varner explained that the French Government is applying Instructor competency requirements to visiting paragliding and hang gliding Instructors. There is therefore a French project to produce procedures for Instructor Competency recognition. The EHPU subcommittee safety and training is involved with this work. All EHPU members should send details of their Instructor training and licensing scheme so that they can be fitted into the ‘equivalence’ system. Luca Basso explained the SaFly system which allows competition or recreational pilots to be monitored and tracked in real time during flights. This can make competition flights much more exciting for spectators and audiences. It also has safety benefits. Any association wishing to co-operate on this work should contact Luca. At the end of the AGC the EHPU presidency rotated to Hungary. Next EHPU AGC will take place 19. February 2011 in Budapest. EAS elects new President and Secretary General. See EAS newsletter No 32. European Parliament votes to exclude aerodromes mainly used for sports and recreational flying from common European rules! The EHPU wishes to express its deep concern about the continuing situation in hang glider competitions relating to sprog adjustment. Lowering sprogs confers a performance advantage at the expense of pitch stability and pilots who carry out this adjustment are either unaware of, or reckless about the adverse effect upon hang glider stability. The EHPU believe that the competitors who undertake this activity are introducing unacceptable dangers into the competition and the improved performance is therefore an unfair advantage over fellow competitors. In the view of the EHPU this amounts to cheating and should not be permitted. The EHPU is also concerned that the lowering of sprogs by international level competition pilots sets a very bad example for other pilots who might be tempted into copying this hazardous practice. We wish to see an effective program put in place to prevent or dissuade competition pilots from making these dangerous modifications. Chamonix minutes are online now. Please see internal for details. EAS is looking for a new Programme Manager starting 1st of June 2008. Please see recruitment brief for details. 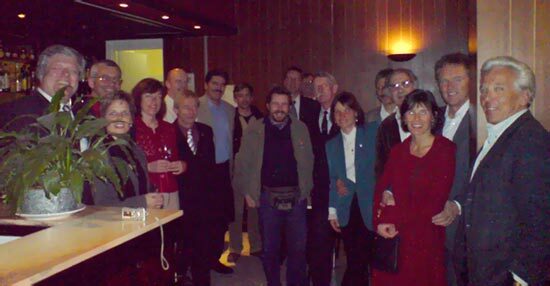 The Annual General Meeting was held on 1st/2nd March 2008 in Zurich/Switzerland. 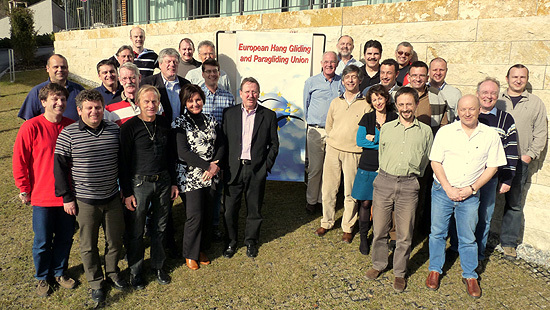 The EHPU plenary welcomed the Hang Gliding and Paragliding Associations from Austria and Romania as new EHPU members. Presentation 'Access to Airspace' from Guenter Bertram (EAS). 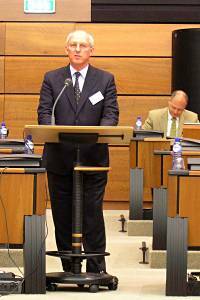 Presentation 'New European Regulation Proposals in Light Aviation' from Jan Fridrich (LAACR). Presentation 'European General Aviation Safety Team' from Jan Fridrich (LAACR). The EHPU plenary welcomed the Hang Gliding and Paragliding Associations from Hungary and Ireland as new EHPU members. Poland and Austria have expressed their intention to join the EHPU. Will Hang Gliding and Paragliding fall under the European Regulation? This question has been raised during the current rule making process for the Amendment COM 579 of Regulation 1592 which deals not only with the extension of EASA competence for licensing and operation setting but also with the creation of a new framework for Leisure Aviation. Several other topics have been discussed in the 7th EHPU annual General Meeting, e.g. "Speed-Gliding", and the participants agreed that all in all it has been a productive atmosphere. One of the main topics of the EHPU annual general meeting 2007 was "access to airspace for hang gliding and paragliding." Chris Bouman, a hang glider pilot who works for Eurocontrol, presented a power point presentation made by Mr. Armit, Eurocontrol, explaining the future plans. "As regards revised class E airspace (i.e. future K Airspace) outside CTR's, the EHPU strongly supports that the norm is that no 2-way communication is required except in those areas where this is necessary for demonstrable safety reasons. Given the many issues still outstanding, including health risks and the availability of suitable transponders, the EHPU does not currently see a sound basis for requiring hang gliding and paragliding to carry transponders anywhere. It is the EHPU position that existing controlled airspace, established in the past for reasons that were applicable at that time, should be subject to reconsideration, with the aim to change this airspace into uncontrolled airspace wherever this is possible. Member nations are reminded that they should constantly be aware about redundant controlled airspace and take steps locally to encourage the authorities to release this airspace as class G."
The EHPU is a member of Europe Airsports (EAS), where the efforts of all airsports are coordinated. EAS has a delegate in the two high level Eurocontrol committees which make policy and approve actions of working groups: the Airspace and Air Navigation Team (ANT) and Stakeholders Consultation Group (SCG). "Currently airspace classification is still an important issue. Above FL 195 the airspace is now mainly class C, harmonised according to the wishes of the EU. Below FL 195 the classification is left to national regulators. Here a major step forward was done without much hassle in the spring of last year, by introducing the ICAO classification in all of the ECAC states. ICAO uses the letters from A - G to name the different air space categories. In use are mainly air space C, D, E and G. This will be probably true for some years to come." "Asked if it is National Authorities which would decide upon changes to the classification of airspace (..below FL 195..), Mr. Armit agreed that this is a State responsibility but EUROCONTROL would provide guidance material." "Any air space infringement is bad for our reputation as pilots. An accident due to a violation would probably lead to more restrictions." New on ehpu.org: Have a look at our Video of Hang Gliding and Paragliding "Flying like a Bird". This video has been presented in the lobby at the first EUROCONTROL Sporting & Recreational Aviation Conference in Brussels (see below) to provide basic information about Hang Gliding and Paragliding. Other videos have been shown during the presentation of Klaus Tänzler (see here for presentation and videos). 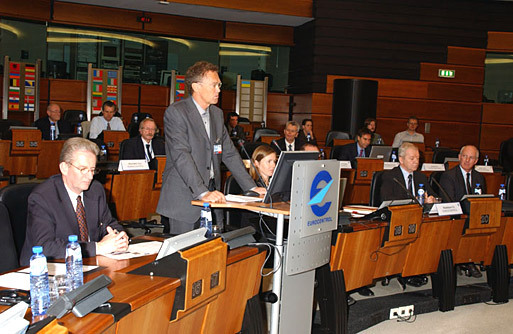 EUROCONTROL, the European Organisation for the Safety of Air Navigation and EUROPE AIR SPORTS (EAS), the association of the European National Aero Clubs and European Air Sports Unions, held the 1st Sporting & Recreational Aviation Conference at the EUROCONTROL HQ in Brussels on Friday 1st December 2006. See Europe Airsports Newsletter for more information. EHPU General Secretary Klaus Tänzler explained the needs and concerns of Hang Gliding and Paragliding. His motivational powerpoint presentation (with video clips) has been well received. 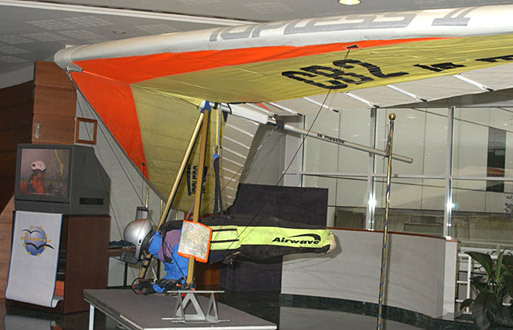 Beside the hang glider (from EHPU Airspace Expert Chris Bouman) informed a video presentation in the Eurocontrol lobby about Hang Gliding and Paragliding. This link shows an extraction of the IAOPA Newsletter concerning EASA policy: IAOPA Newsletter 11/06. This newsletter shows the current activities of Europe Airsports. EHPU is a member of Europe Airsports. Especially the items NPA 06/2006 on safety regulation of aerodromes, Unmanned Aerial Vehicles and the Eurocontrol matters are currently being worked on by EHPU. Newsletter 07/06. 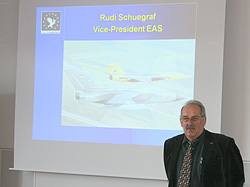 On 25/26 March 2006 the General Meeting of EAS was held in Cologne. Here you find the EAS Newsletter with general information on the meeting matters. 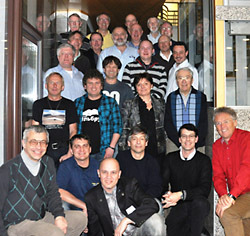 EHPUs annual General Meeting has been held in Thalwil / Zurich on 18th February. The Presidents and Secretary Generals of 13 Hang Gliding and Paragliding Federations were present. The Czech federation LAA has been welcomed as new member. Europe Airsports President Sir John Allison visited the EHPU meeting and held a very well received speech. You find his speech here. Roland Stuck, President of the European Gliding Union (EGU), has been invited too in order to advance the coordination of the policies between gliding, hang gliding and paragliding. You find his presentation here. Europe Airsports report on last year's activities just came out, see here. EHPU supports the work of Europe Airsports as a paying member. "One major lesson I learned from the workshop was that EASA and its officials dealing with the content and conduct of the workshop were acting as partners. They showed a strong interest in improving the relationship to the recreational and airsports aviation community. During the two years time since EASA was officially established as Aviation Agency of the EU the original staff experienced a steep learning curve which resulted in a better and more complete understanding of the airsports system in the 25 member states. It is now acknowledged that EAS is representing the expertise in that field of aviation, the EAS advice is well accepted." This Workshop Part M dealt with matters of no concern for hang gliding and paragliding. EASA shows no intention to deal with our affairs now or in the future. An important issue is the redesign of European airspace. Restructuring of upper-airspace has been decided upon. Lower airspace issues finally resulted in a decision of Eurocontrol to recommend not to define a common Lower Airspace Level for the member-States. Regulation of lower airspace is left to the National Authorities. This is a satisfactory result – however, national developments should be monitored carefully by our Members! Another issue of great concern was the regulation for charging air navigation services where an intended coverage of VFR traffic would impact our community. The issue is suspended at European level, also by pressures from EAS, but again National regulators can impose unsatisfactory rules. This year the ESTC Meeting will be held on the Wasserkuppe in Germany, a historical site for aviation. Current issues of safety and training matters will be discussed. Here you find the agenda. The EU is interested to identify areas in which an EU action could present an added value in promoting the social function of sport in relation to initiatives already developed by sporting organisations and Member States. One of the questions to be addressed: How can sport contribute to social cohesion in Europe? The European Commission has convoked this Consultation Conference as part of its efforts to consult with all major stakeholders on the present and future interplay between the EU and sport – how best to match expectations. During two days, representatives of the European sport movement, including Olympic and non-Olympic sports, big and small organisations, elite and mass sports, academics and NGOs active in the field of sport, have the opportunity to make their voice heard and to share their different experiences and perceptions. In coordination with FAI - who formally represents sports matters with the EU - it is agreed that a Europe Air Sports delegation will attend the Sports Conference, since two important issues have a potential impact on regulatory matters where Europe Air Sports represents the air sports community. Lobbying on European level has to be accompanied by lobbying on national level. This article shows an example of national lobbying in the UK where the British Hang Gliding and Paragliding Association has joined the “GA Alliance” together with other national airsports organisations. Now the Under Secretary of State has met with GA Alliance members and so connections on ministerial level have been established. At the EAS meeting in Friedrichshafen at 23. April 2005 the president Sir John Allison gave an impressive description of EAS in his presidents report. It is worth reading! The board election brought new board members: Frank Peter Doerner (Germany) a lawyer specialized in European Law and Aviation Law, Marcel Felten (Luxemburg) former TO Airspace and Jean Paul De Looff (France). The re-elected Louis Berger (Belgium) continues to hold good connections to the European Commission and European Parliament. The EAS president offered to the FAI, the European Unions (such as EHPU) and the national Aero Clubs to send for each an observer to the bureau meetings. 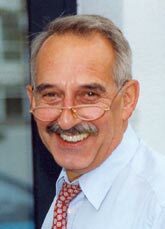 The EMF (European Microlight Federation), the EGU (European Gliding Union) and the EHPU agreed to send Roland Stuck as their observer. The aero modellers have not yet founded an European Union but are considering the foundation. The EPU (European Parachuting Union) is not an EAS member because of money reasons but has been represented in this EAS meeting. For the EHPU it makes sense to agree that the EGU president Roland represents the Unions in the EAS board during the next year, because the EGU has the same intentions in Airspace matters as the EHPU. There is a close and friendly relationship between the EHPU and the EGU. While hang gliding and paragliding is exempted from EU regulations on licensing, airworthiness and maintenance - gliding is not. As a result the EGU has to deal with much more urgent European regulation problems than the EHPU. During the EAS meeting the representatives for powered flying and gliding expressed their concern about the EASA opinion on maintenance and the unwillingness of EASA to take on board the EAS proposals. (We are exempted from this regulation.) Knowing that the European Commission tends to accept EASA opinions the EAS meeting agreed a strategy to tackle the problem. The EMF presented their wish to propose to EASA a new definition of microlights which is currently described in Annex II of EC Regulation N.1592/2002. The EMF wishes to raise the maximum take off mass to 600 kg. As changes of Annex II will also affect other airsports the EAS has tasked a working group with the creation of a new Annex II draft. It should then be proposed to the European governing bodies by the EAS. The report of the Secretary General of Europe Airsports gives an overview about the efforts taken last year. The European Airsports organisations such as the EHPU coordinate their efforts within Europe Airsports (EAS). Conduct research into specific aviation regulatory areas. The EAS Board has decided that, as from June 2005, the duties of the Programme Manager will be taken over by Mr. Rudolf Schuegraf. The former Starfighter and PPL-A pilot has worked as Secretary General for the German Aero Club for several years. Since 1991 he has worked voluntarily for the EAS as a member of task forces of several European Authority bodies where he gained a great deal of experience and insight. "Member States shall exempt from charges: a) flights performed by aircraft of which the maximum take-off weight authorisied is less than two metric tons." But still it is only a draft. During the General Aviation Day of Eurocontrol in Brussels at 8. April 2005 the Europe Airsports President Sir John Allison adressed the conference on behalf of the national Aero Clubs and the Airsports Unions like the EHPU. You can find his speech here. EHPU has been represented by EHPU Secretary General Klaus Tänzler, who attended the conference together with the EHPU Airspace specialist Chris Bouman (a Dutch hang glider pilot, who works for Eurocontrol) and Hanspeter Denzler from the Swiss Hang Gliding and Paragliding Association (SHV). The General Aviaton Day brought clarification that for the time being Eurocontrol will not propose regulation for the Airspace below FL 195 if the European Commission accepts this which is likely. That means the national regulations will stay for the airspace used by us during the next years. But work for below FL195 will continue through Eurocontrol working arrangements, such as the Task Force A, which will need continued attention, as this will be an important basis of what states will do without regulation in place, and of course a basis for any future regulation. Another concern of aisports pilots is that in the future also VFR airspace users might be charged for using airspace by control service providers. Up to now only IFR airspace users have to finance control services which are provided also to VFR airspace users. Eurocontrol stated that it is up to the states to make exemptions from the charging but it is a request of the European Commission that cross subsidies must be made transparent. Here you find some of the presentations made on: Mode S, Charging Policy, Airspace Classification. The yearly General Aviation Day is an important meeting to get an update on developments that could affect General Aviation. The majority of participants and subjects will be on issues more related to motorised General Aviation (IFR and VFR), but it is also the adequate forum for the European Airsports organisations to make their points. Therefore EHPU will attend the meeting. One of the issues at hand: We want to avoid fees for using certain airspaces. A Charging Scheme for Air Navigation Services has been drafted already by Eurocontrol and there is an Exemption Table relating to the Charges. The implications of this new regulation will be discussed at the General Meeting of Europe Airsports in Friedrichshafen on 23 April, where delegates of the EHPU and other Airsports Organisations will be present. EHPU seeks to avoid EASA fees and charges for our sport. New Fees and Charges regulation (pdf).